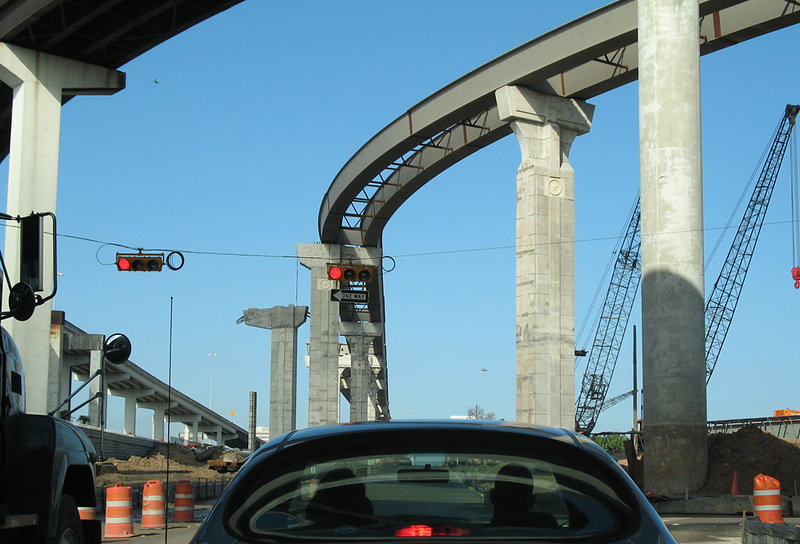 These driver's views going westbound start at Loop 610 and proceed to State Highway 6, with a detour to the frontage roads at Beltway 8. Approaching Silber. 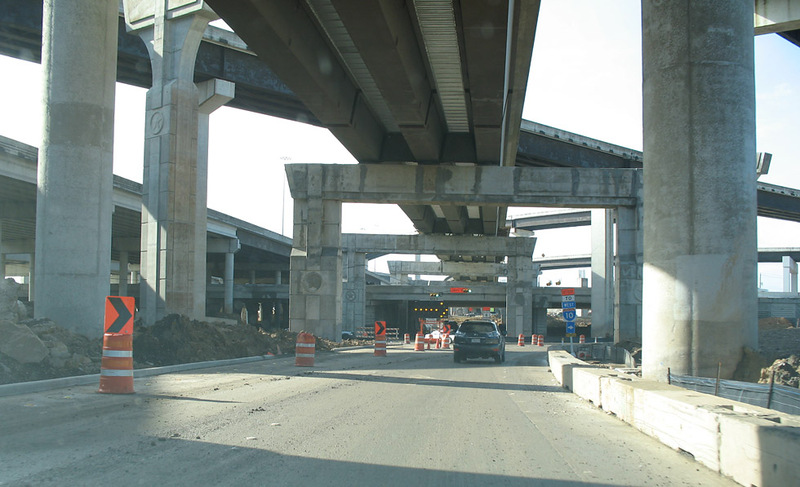 Traffic is on the new pavement and work continues in the interior of the freeway. At Antoine. The expansion is mostly on the south (left) side of the freeway. At Chimney Rock. The braided ramp on the right is open to traffic. At the Voss exit. 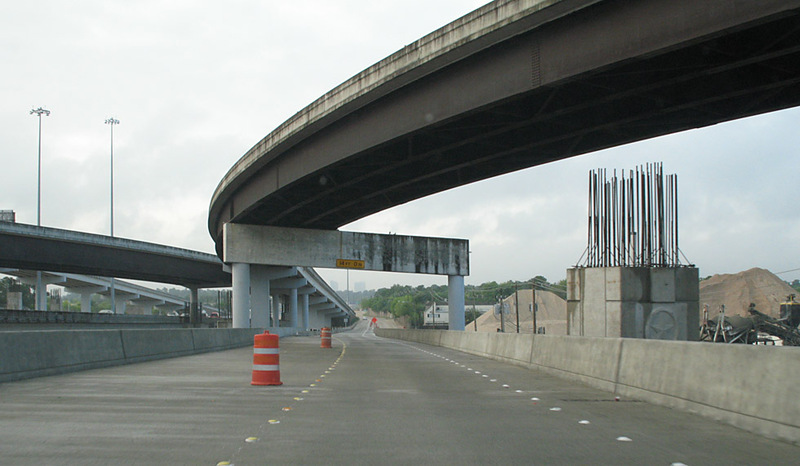 The next phase of paving will occur in the freeway interior (left side of view). 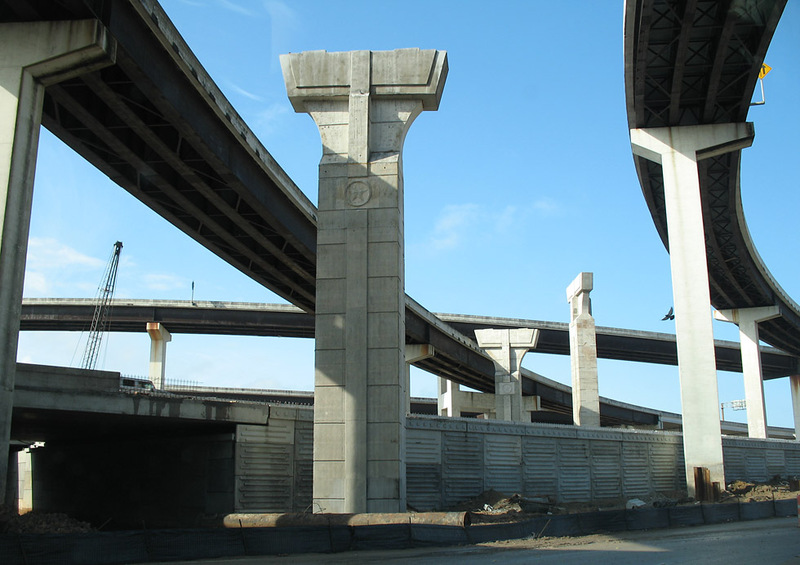 Piers for a braided ramp are visible on the south side of the freeway. At the Gessner exit. 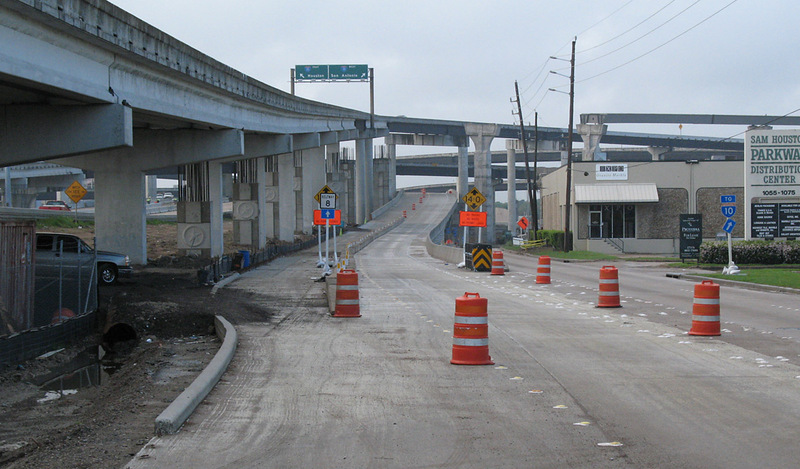 The westbound frontage lanes are still on the Old Katy Road. Further to the right the cleared area for the new frontage roads can be seen, and the main lanes will be expanded to the right where Old Katy Road is now. 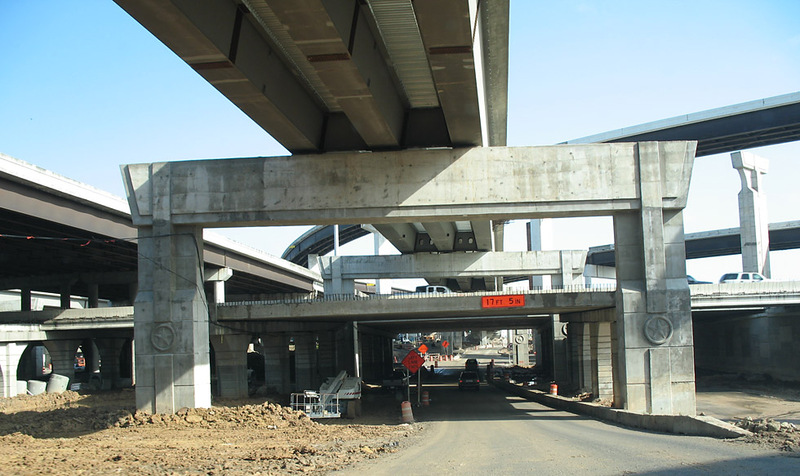 This will be the widest section of the freeway. Piers for a braided ramp just east of Gessner. 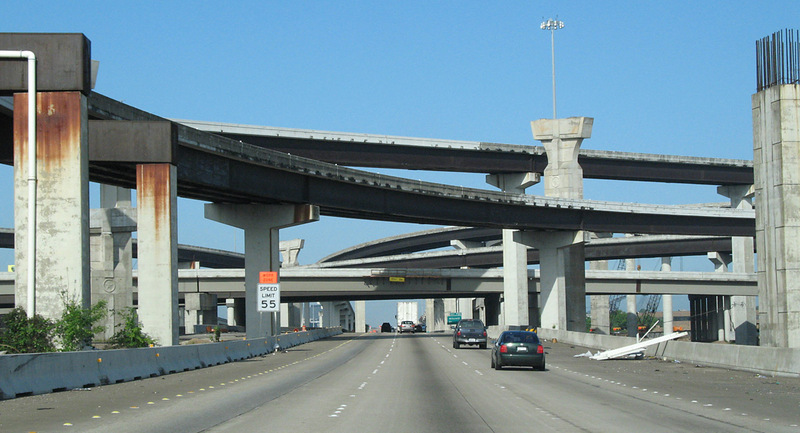 The Beltway 8 interchange becomes visible as we cross Gessner. 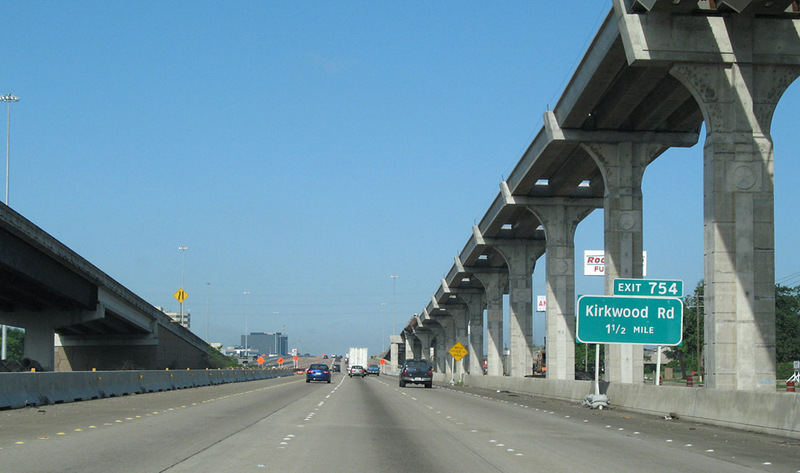 The exit to the Sam Houston Tollway still uses the original ramps, which is a left exit. The new ramps are on the right. 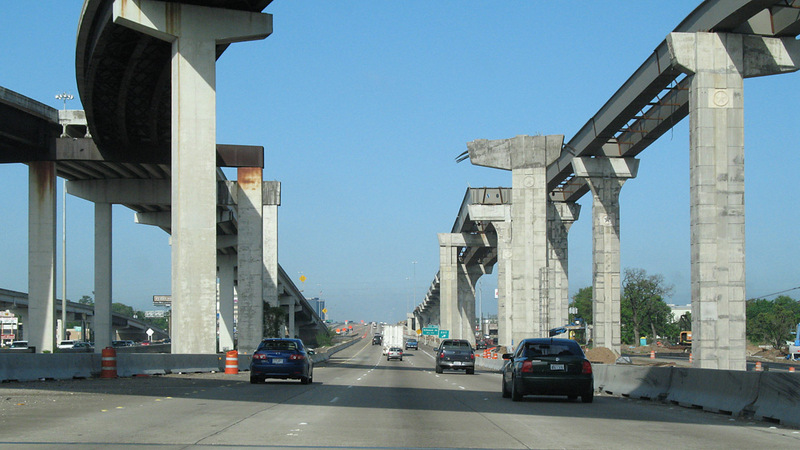 The existing ramps, which will be demolished, are on the left. 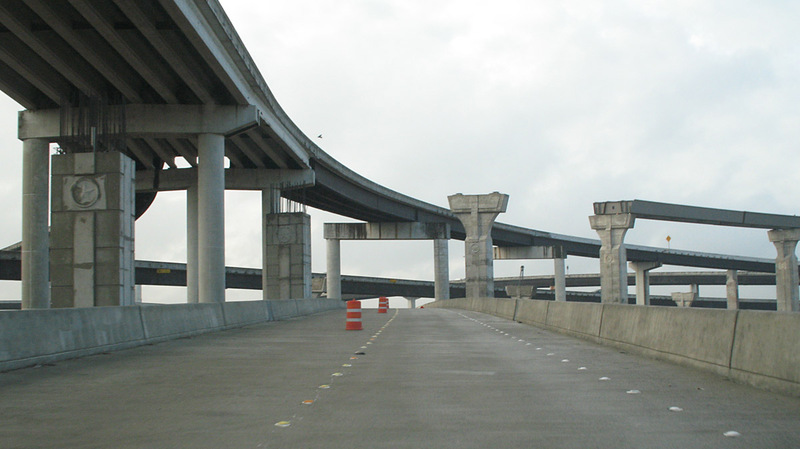 The frontage road bypass lanes on the Beltway 8 southbound frontage road are now open. 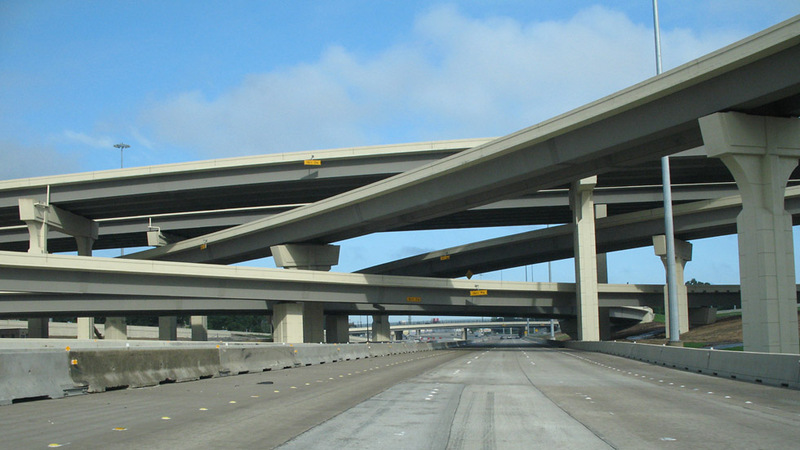 This is the first time such a bypass through an interchange has been built in Texas or (as far as I know) the United States. Similar bypasses have been used in Montreal, Canada and possibly elsewhere. Driving on the frontage road bypass, which allows frontage road vehicles to drive over the interchange without encountering any traffic lights. On the downgrade of the frontage road bypass, with the frontage road ahead. 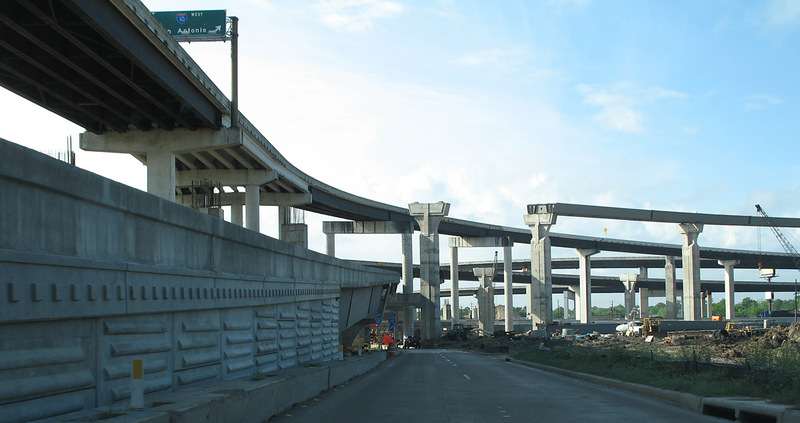 This view is along the southbound Beltway 8 feeder, with the bypass just rising from the ground on the left. 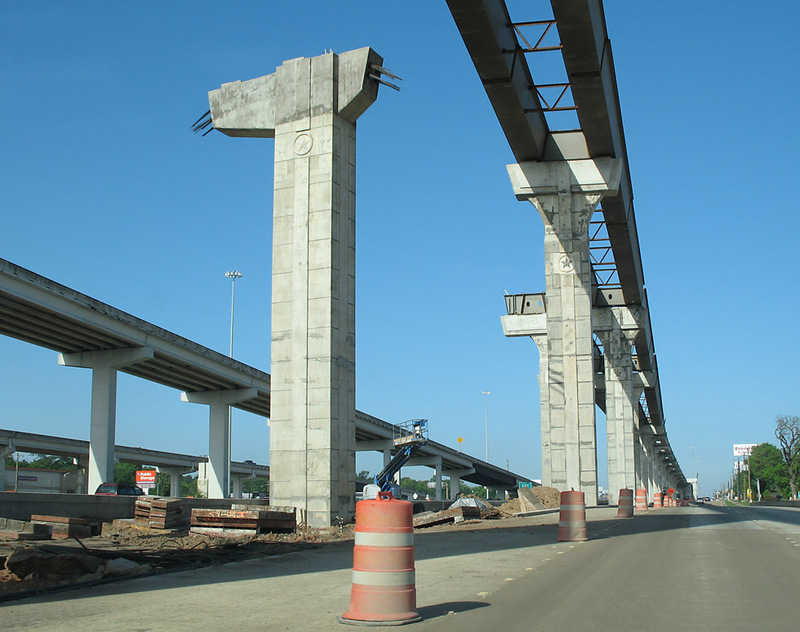 This is a view on the regular frontage road of southbound Beltway 8, with the bypass structure overhead. The frontage road underneath I-10 is currently closed. This view looks southwest on the northwest side of the interchange. This view is on the westbound feeder of I-10, looking west. 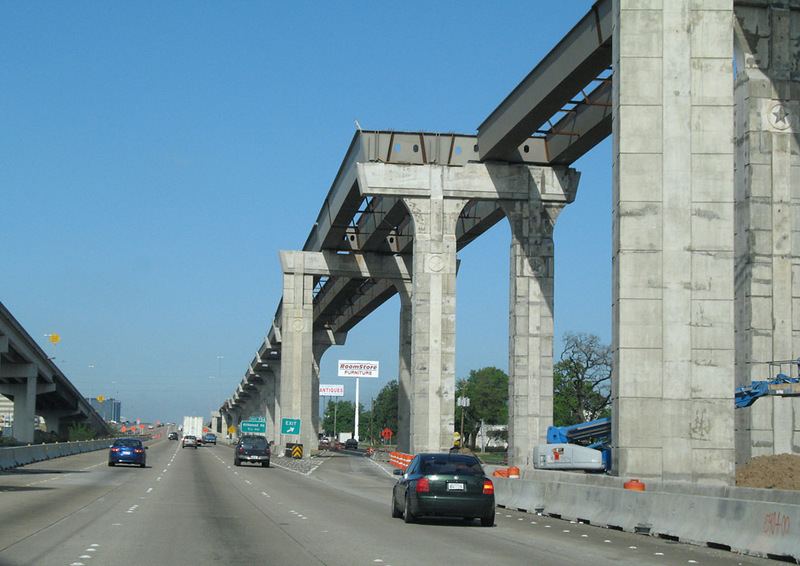 On the westbound I-10 feeder, west of the Beltway 8 interchange. This is northbound on the Beltway 8 frontage road, with the bypass structure overhead. The bypass looked like it was about to open. Now we are back on the Katy Freeway main lanes, heading westbound at Wilcrest. At Dairy Ashford. The construction in progress is off to the left side of the photo. We are now on the westbound frontage road. To the left is the new HOV access ramp at the Park and Ride Lot. 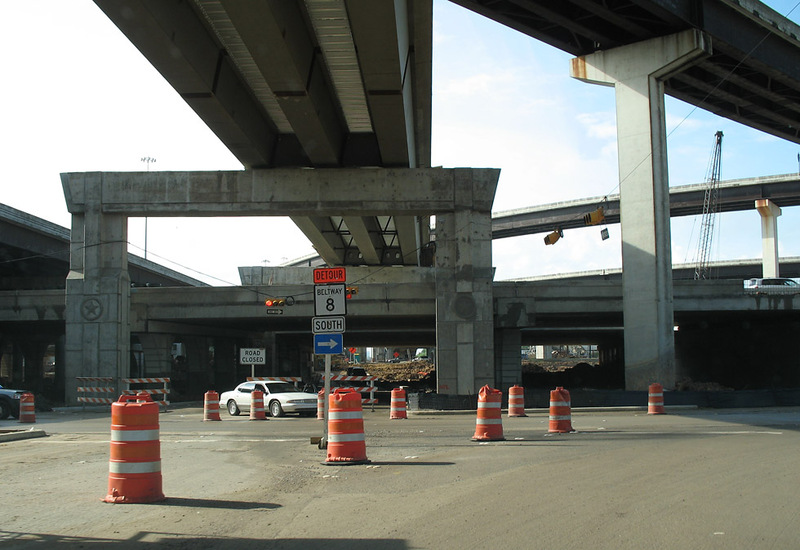 This is the old HOV access ramp, currently being demolished.